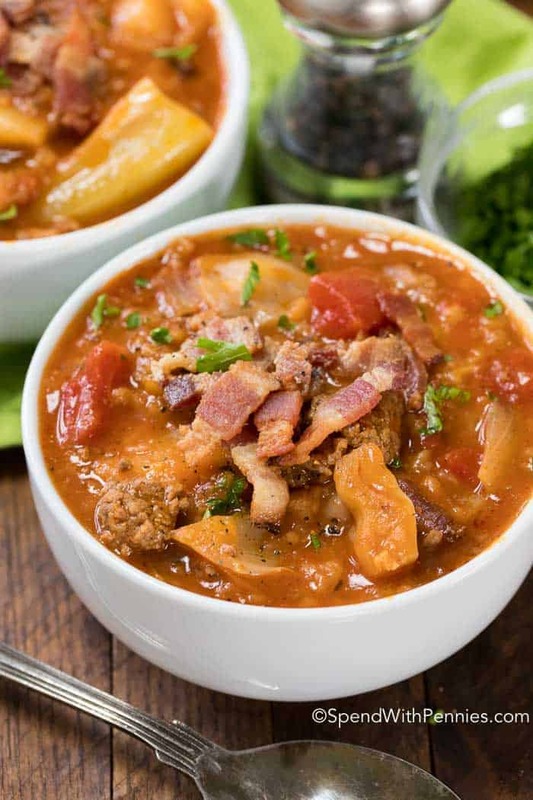 This easy Sausage & Cabbage Soup is the ultimate comfort food. 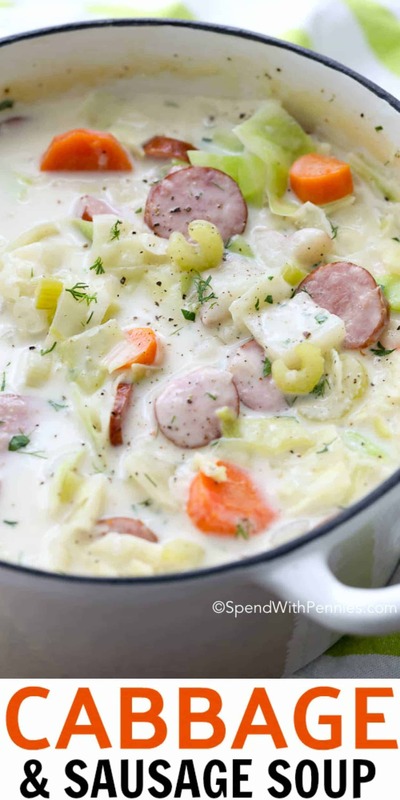 A beautifully luscious soup with smoky sausage, fresh vegetables and of course sweet tender cabbage simmered in a flavorful creamy broth. When the weather gets cooler, in my house it’s officially soup season. 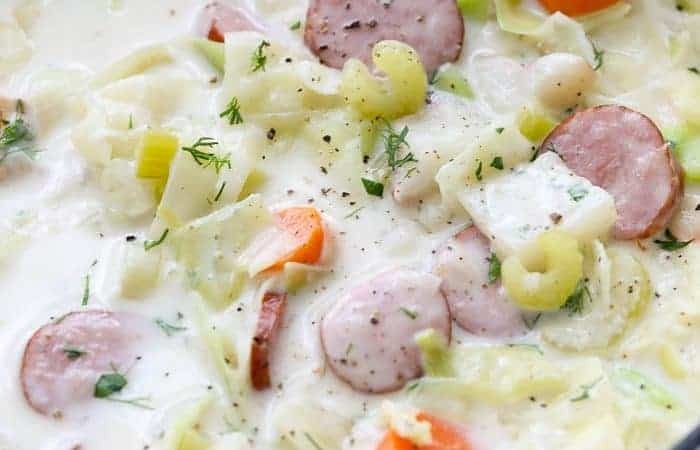 There is just something about a delicious warm bowl of soup that warms your belly from the inside out and this creamy cabbage soup recipe is no exception. 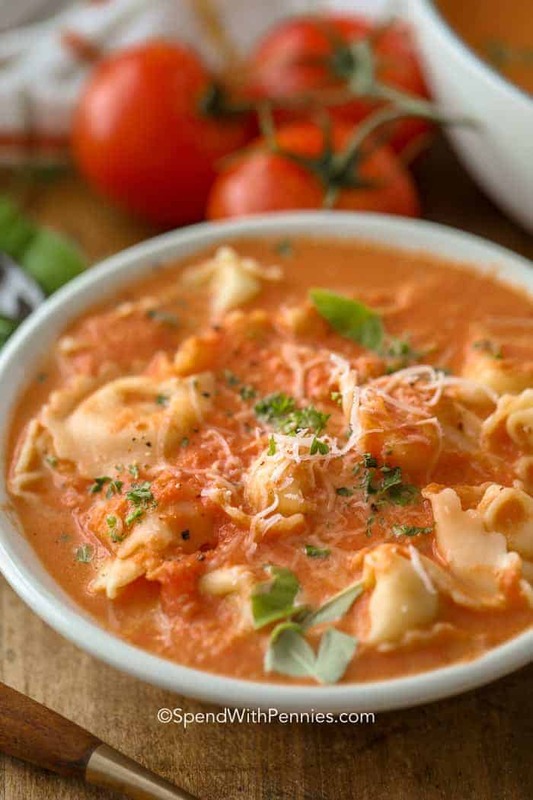 If a hug were food, it would be this soup. 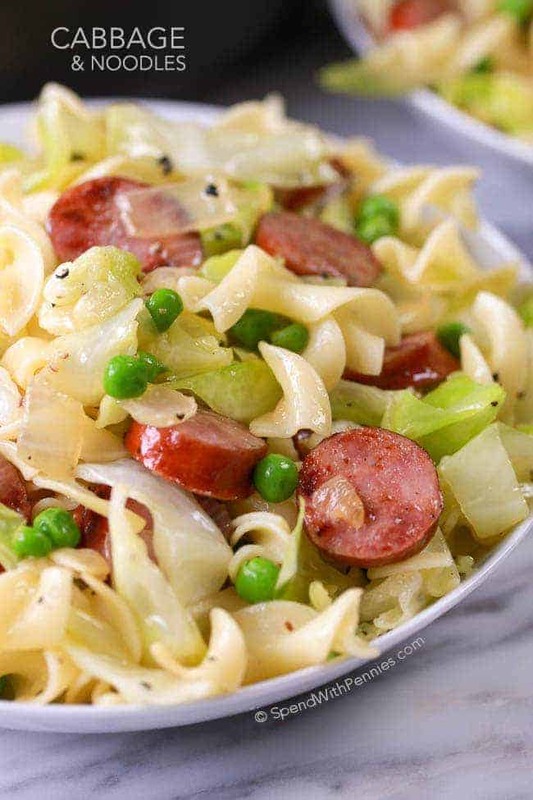 Cabbage and sausage just seem to go hand in hand. 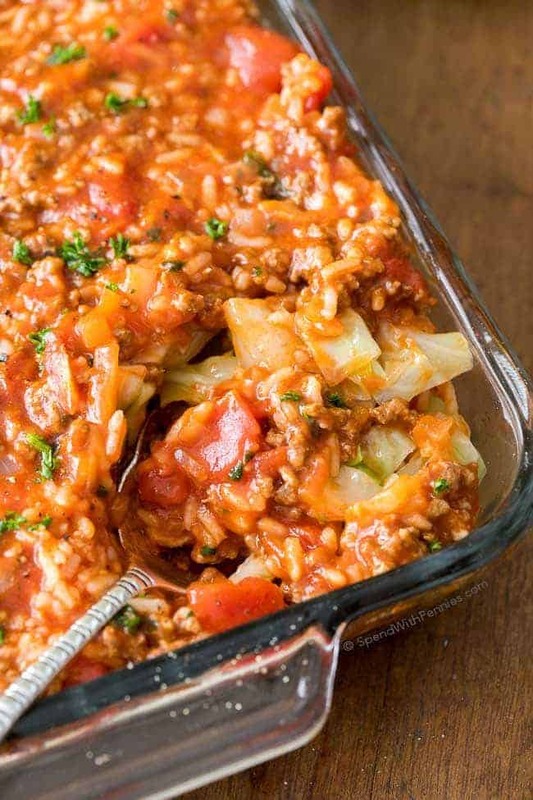 If you’ve read my blog before, you likely know that I love all things cabbage from Cabbage Roll Soup to Sausage and Cabbage cooked on the grill! Cabbage is inexpensive, a little bit goes a long way and once cooked, it’s tender with a delicious sweet flavor. This is just one of my many favorite cabbage recipesfavorite cabbage recipes. If you don’t cook with cabbage often, you can find lots of great info in The Ultimate Guide to Cabbage! 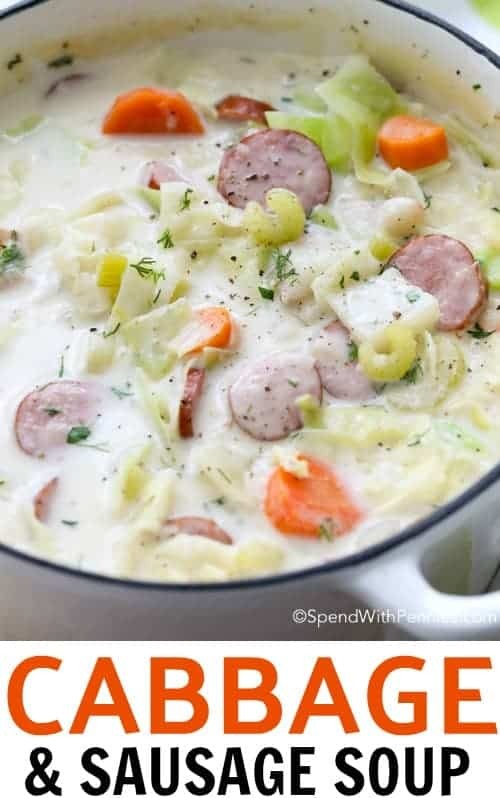 This easy soup starts with sausage, I use kielbasa but you can also use a garlic sausage or pretty much any smoked (fully cooked) sausage that you’d like. I make this cabbage soup with potatoes to give it a nice creamy texture (and to keep my belly full all day long). 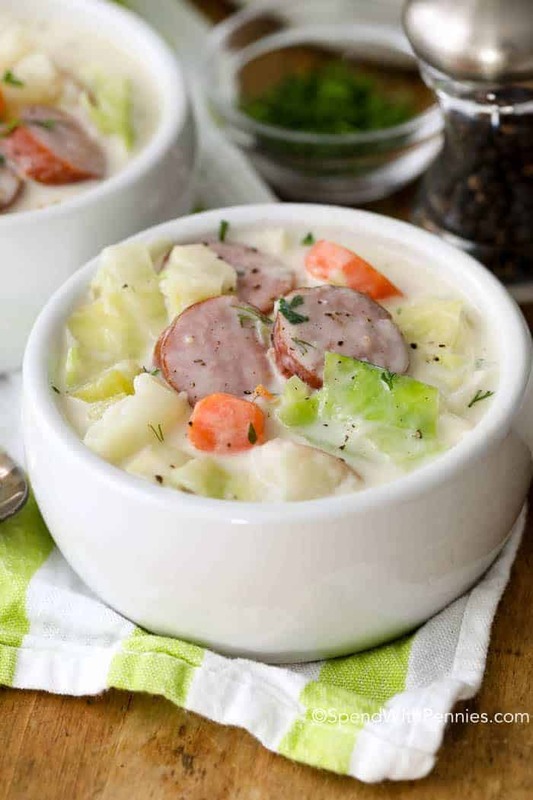 Fresh carrots and cabbage add both fresh and sweet flavors to this soup and of course cream makes it buttery irresistible. 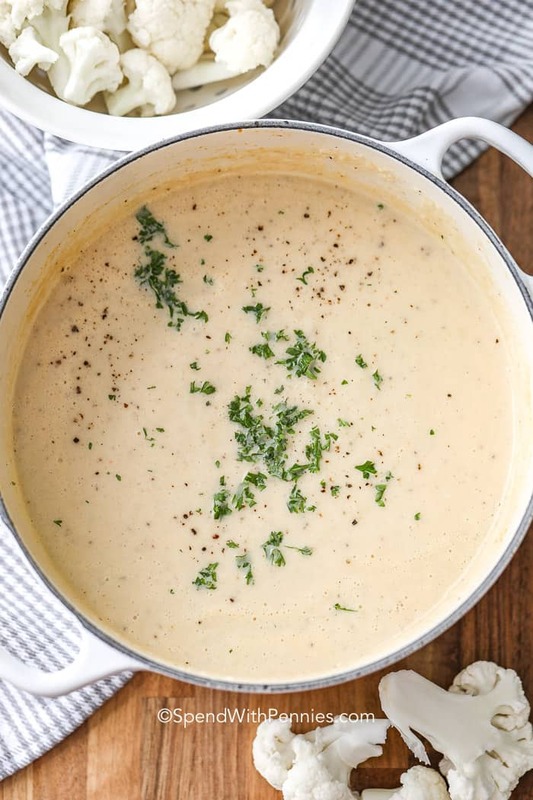 While this is a creamy soup, keep in mind it is not a thick soup like a chowder. The creamy portion of this soup comes from making a roux. While roux may sound like a fancy or difficult cooking term, it’s really easy. A roux is the base for most white sauces (and even Sausage Gravy) and starts by cooking butter and flour (to get rid of that raw flour flavor) and then adding in milk or cream and cooking until thick and bubbly. The roux is then added to the soup in this recipe giving it a delicious buttery cream flavor. 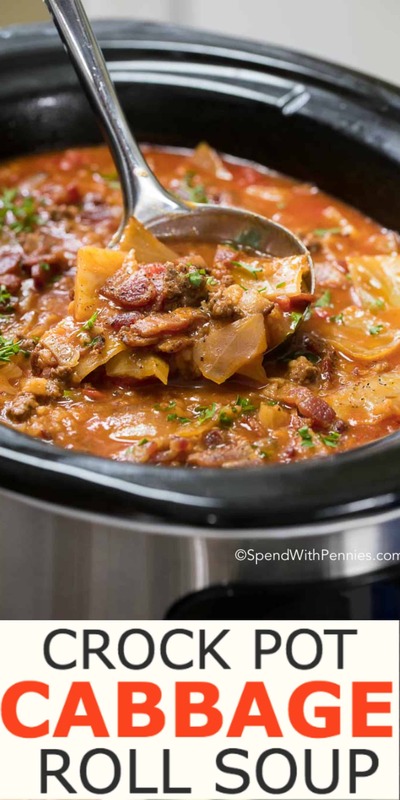 Crock Pot Cabbage Roll Soup – Easy favorite version of cabbage rolls! Cabbage and Noodles – Classic Haluski recipe! Cabbage and Sausage Foil Packets – Perfect for grilling or baking. 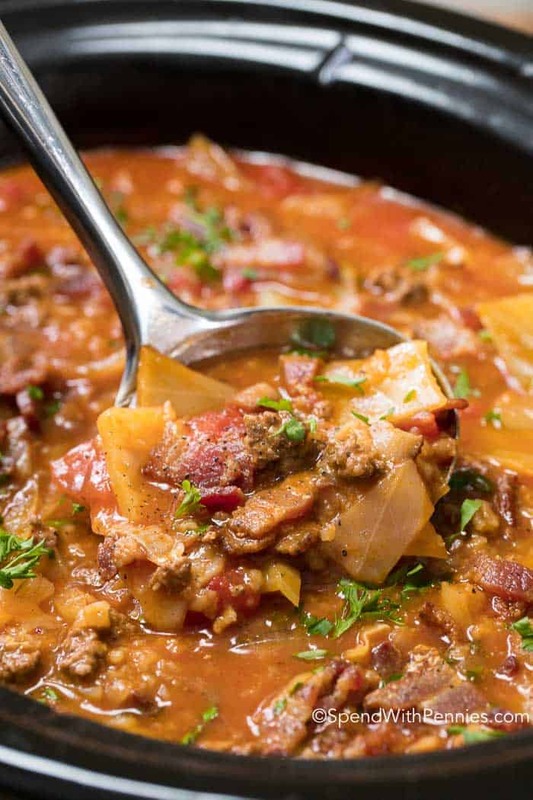 Cabbage Roll Soup Recipe (video) – All time reader favorite. Easy Cabbage Rolls – Best ever homemade cabbage roll recipe. 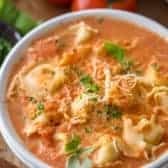 Slow Cooker Cabbage Soup – Healthy veggie filled soup! If you’d like your soup to be thicker, you can certainly increase the butter/flour mixture to about 3/4 cup each while leaving the milk the same. I also give my potatoes just a slight little mash with a potato masher to help thicken the broth somewhat. We add a little bit of fresh dill to this soup at the very end for a pop of freshness. If you don’t have fresh dill you can substitute dry dill and add it along with roux to allow it to rehydrate. 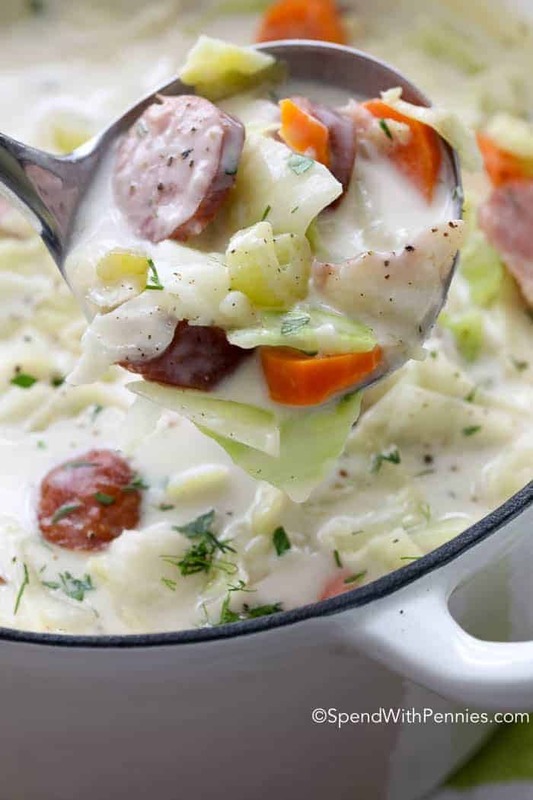 Can you Freeze Creamy Cabbage Soup? Unfortunately, most soup recipes that contain dairy don’t freeze well (non-dairy is usually ok). The soup can separate and the texture can become grainy. I would suggest freezing a portion before adding the dairy in this recipe. 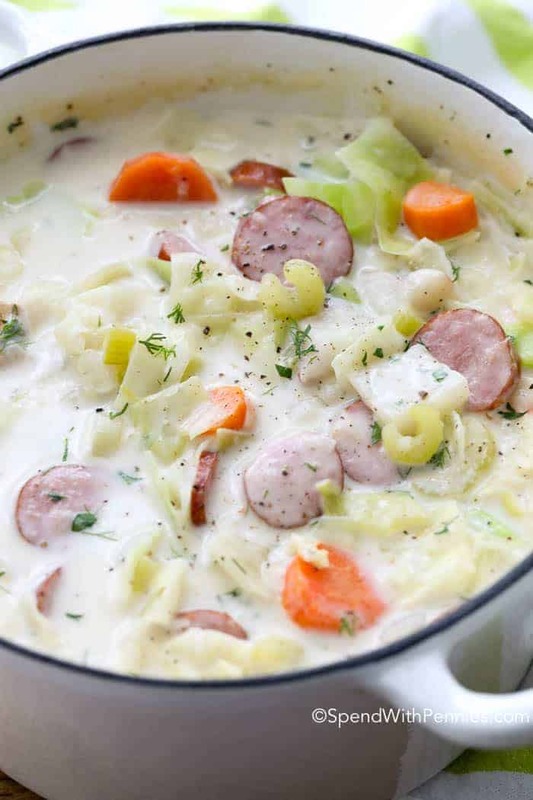 This creamy Cabbage Soup contains smoky sausage, fresh vegetables and of course sweet tender cabbage simmered in a flavorful creamy broth. Cook sausage, onion and butter until onion is tender. Add celery, carrot, potato, cabbage, broth and salt & pepper to taste. Bring to a boil. Reduce heat, cover and simmer 10-15 minutes or until potatoes are tender. Meanwhile, melt butter in a small saucepan. Stir in flour and cook over medium heat about 2 min. Add milk and cream and stir until smooth. Continue whisking until thick and bubbly. Once vegetables are tender, add cream mixture into the soup. Allow to simmer 5 minutes. Remove from heat and stir in dill and parsley. 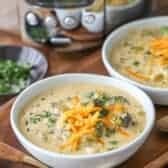 Baked Potato Soup – Creamy and delicious, this soup recipe tastes just like a loaded baked potato. Creamy Seafood Chowder – A cream soup fully loaded with tender chunks of seafood! 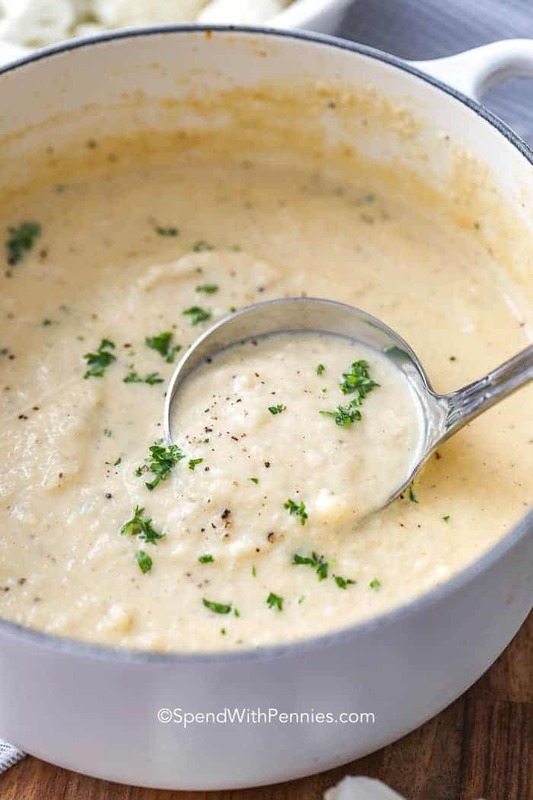 Roasted Cauliflower Soup – A vegetable soup with layers of flavor. 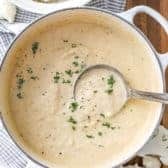 Potato Leek Soup – A classic restaurant soup made easy at home! Ham and Corn Chowder – The best ever corn chowder recipe! Creamy Carrot Soup Recipe – Kids love this naturally sweet carrot soup recipe! 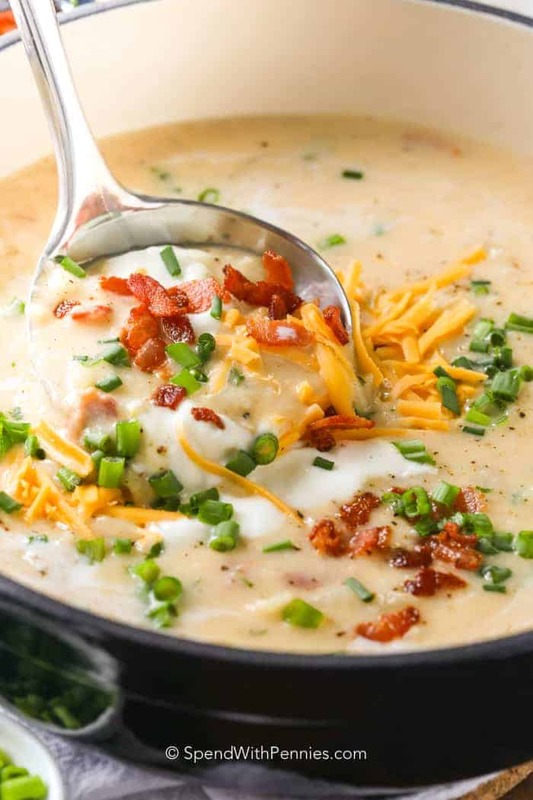 Baked Potato Soup takes all of the comforting goodness of a fully loaded baked potato and turns it into a belly warming soup! A rich and creamy soup with loaded with cheddar cheese and topped with all of our favorite toppings we add to traditional Baked Potatoes! 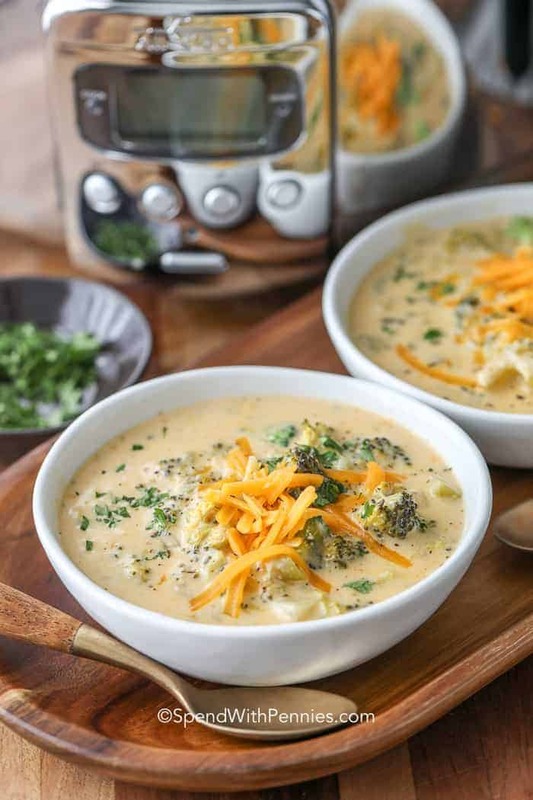 Creamy, dreamy mashed potatoes are added to a savory chicken broth base resulting in this cheesy potato soup. 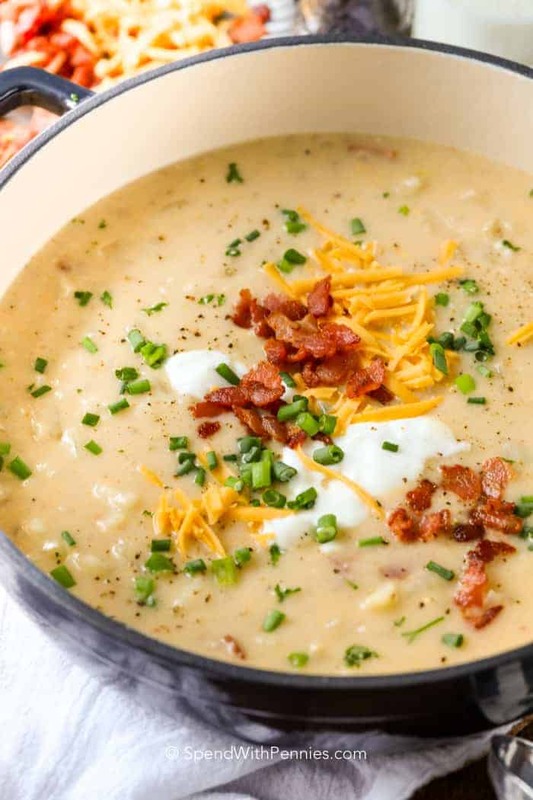 We top this loaded potato soup with our favourite baked potato toppings including crispy bacon, cheddar cheese, sour cream, and green onions. The result is a deliciously rich potato soup that tastes just like those fully loaded baked potatoes we all love so much! Potatoes are one of our favorite veggies, they’re inexpensive, versatile and taste great! There are a ton of ways to prepare potatoes… french fries, Garlic Ranch Mashed Potatoes, roasted potatoes, Loaded Twice Baked Potato Casserole… you name it. 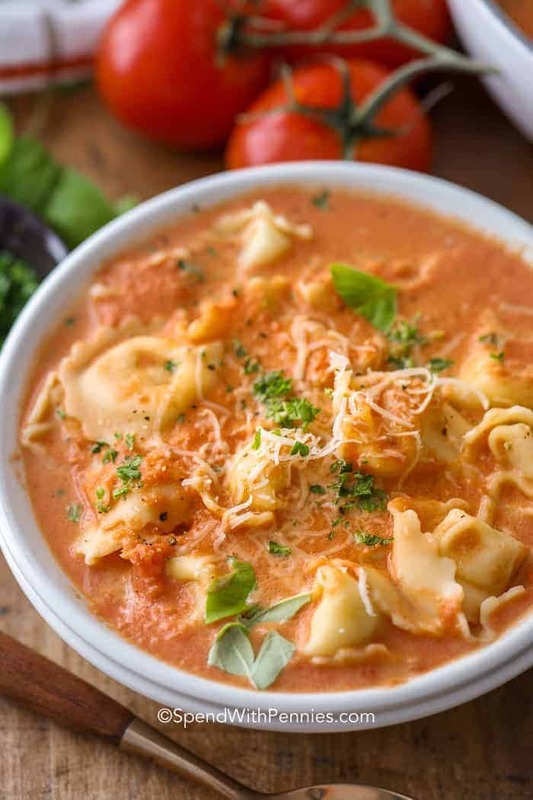 One of our favorites is to enjoy it as a slurpable soup! Fry bacon until crisp (yum!). Cook onions in the bacon drippings until tender. Add broth and mashed potatoes and simmer. Add a splash of buttermilk and of course sharp cheddar cheese. Top with your favorite toppings including green onions, sour cream, crisp bacon and cheese! While this recipe tastes like a baked potato, we actually use mashed (or smashed) potatoes. The use of mashed potatoes makes it quick & easy and creates a creamy texture (and it’s a great way to use up leftovers). Baked Potato Soup is the perfect way to use up leftover mashed potatoes (if leftover mashed potatoes is even a thing?!). If you don’t have leftovers you can make mashed yourself (recipe below) or even whip up some easy Instant Pot Mashed Potatoes. 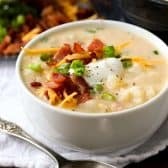 When making mashed potatoes for this recipe, I prefer to have the texture to be a little bit more smashed (or chunky) so the soup has texture. Mashed potatoes are a staple for good reason, they’re inexpensive, delicious and easy to make! They’re the perfect base for gravies and sauces or for topping with Salisbury Steak or creamed corn! Mashed potatoes simply require potatoes, butter, and cream (or milk) with seasoning. Depending on what I’m serving them with, I also add in green onions, garlic or even sour cream. Add these mashed potatoes to the soup or you can use leftover mashed potatoes if you have any! Wash, peel & cube potatoes. Boil the potatoes (and garlic if using) and in a large pot of salted water until fork tender (about 15 minutes). Drain very well and place back into the warm pot. Mash slightly with a potato masher. Add in butter, warmed milk, salt and pepper. Mash to desired consistency. Can You Freeze Baked Potato Soup? 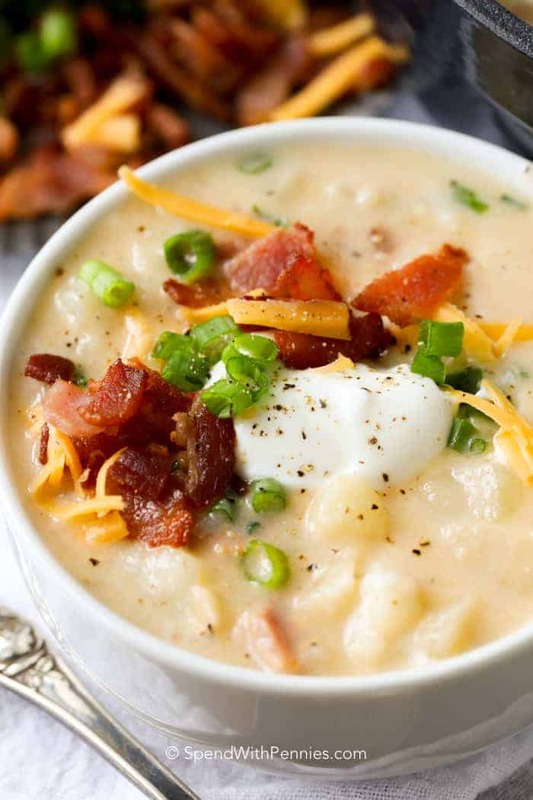 This baked potato soup recipe does reheat well and can last about 5 days in the fridge. Soups containing potatoes can have a change in texture when frozen so I prefer to make it fresh when I can. 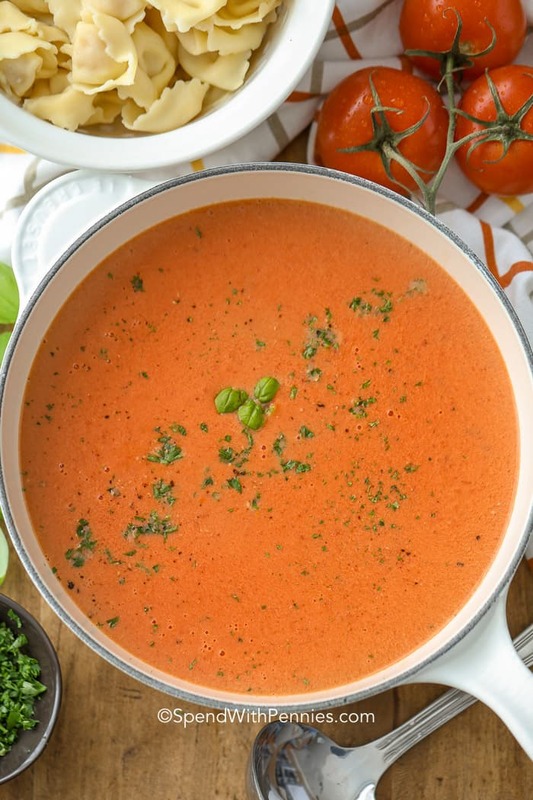 If you do decide to freeze this soup, you’ll want to reheat it over low heat to help maintaining the creamy and smooth texture! 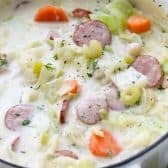 What Can You Add to Potato Soup? 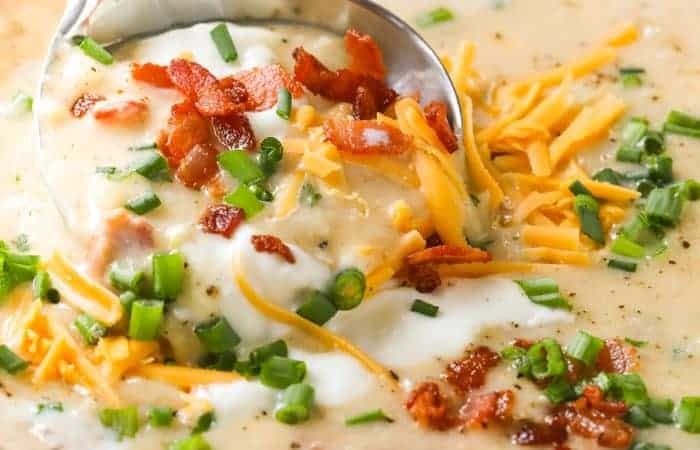 This baked potato soup recipe has bacon, cheese, sour cream, and green onions which are some of my favourite mix-ins for potatoes! 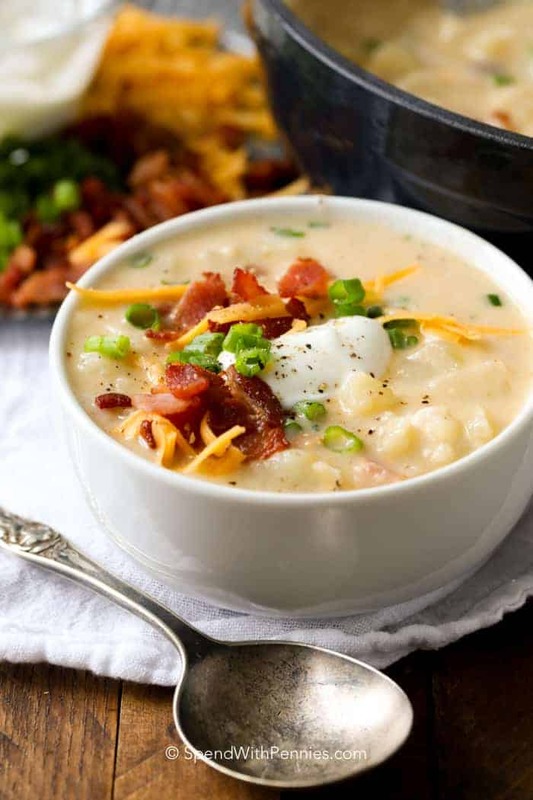 Baked Potato Soup is extremely versatile making it the perfect way to use up any leftover ingredients in your fridge. Cheeses: change them up or use what you have on hand. Be sure to include at least one sharp flavored cheese such as cheddar or parmesan. Scalloped Potatoes and Ham – Family favorite recipe! 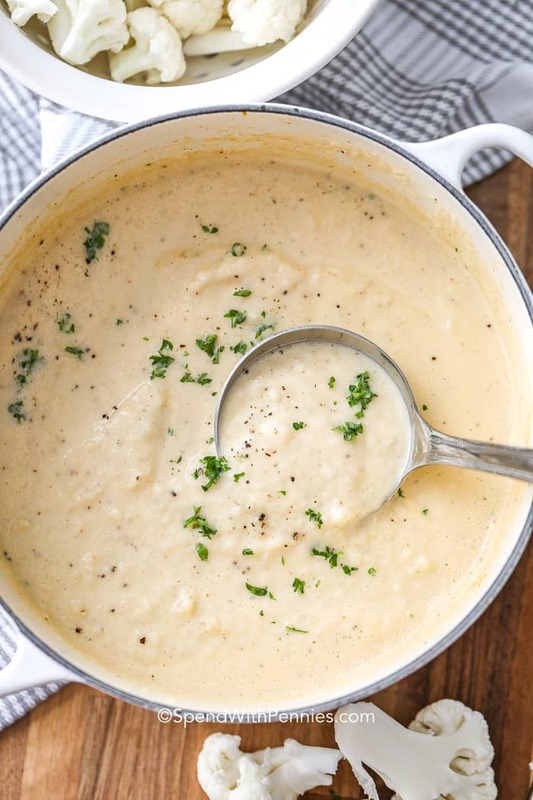 This is honestly the best potato soup I’ve ever had, and it’s perfect for a weeknight meal. This soup takes about 30 minutes start to finish. While it’s cooking I put together a quick tossed salad and add in some crusty bread for the perfect family meal. When I make this soup for my family, I like to serve it but leave the sour cream, green onion, and bacon on the side. I serve the toppings like I would with a normal baked potato. Everyone loves adding their own toppings! Fry bacon in a large pot until crisp. Remove bacon and set aside leaving the drippings in the pot. Reduce heat to medium low and add diced onion to drippings. Cook until tender, about 5-7 minutes. Add garlic and flour, cook 1 minute while stirring. Whisk in chicken broth, bring to a boil over medium high heat and simmer for 5 minutes. Stir in mashed potatoes. Simmer an additional 5 minutes. Add the buttermilk and stir to combine allowing mixture to just come to a boil. Remove from heat and stir in 1 cup cheese, half of the bacon and 1/3 cup sour cream. Garnish with a dollop of sour cream, reamining bacon, green onion and serve hot. 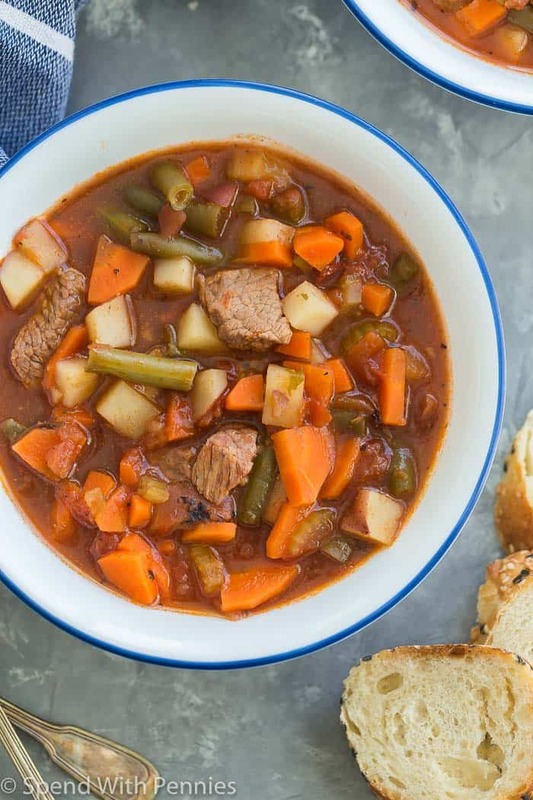 This slow cooker Vegetable Beef Soup is a hearty, healthy meal loaded with protein and vegetables. Made with chunks of beef and all of your favorite veggies! 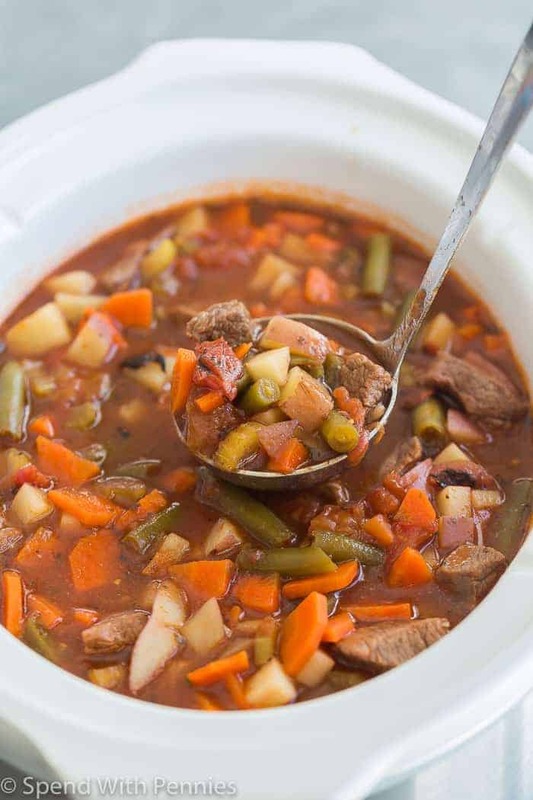 When loading up on vegetables, we love Weight Loss Vegetable Soup and this homemade Vegetable Beef Soup recipe. 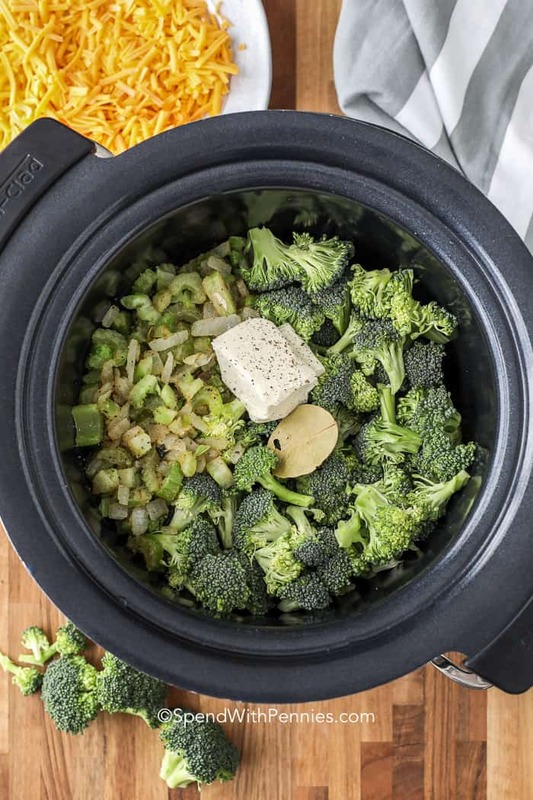 Made in the slow cooker or on the stove top, it’s perfect for making ahead on a busy weeknight! Dinner will be waiting for you when you get home! I am a big time soup lover, and I’ll eat just about any vegetables you throw into it. 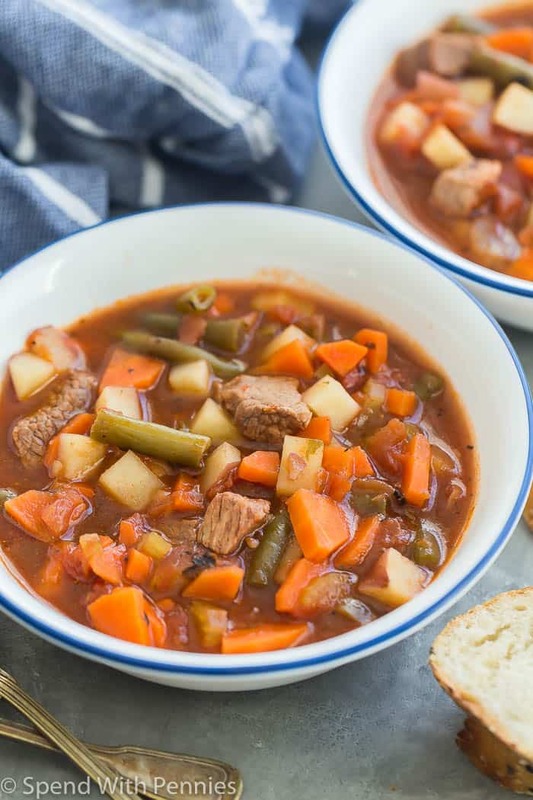 This Vegetable Beef Soup can be made lots of different ways, substituting your favorite vegetables or spices for a combination that your family is sure to love! Be sure to serve this with 30 Minute Dinner Rolls or a nice chunk of crusty bread to soak up all of that incredible broth! If you love slow cooker soups as much as we do (and have some crusty bread handy), try Slow Cooker Chicken Enchilada Soup, Sausage Potato Soup, or Italian Chicken Noodle Soup. Beef: Place your beef cubes in the slow cooker. You can brown them first or you can skip this step, but with soup recipes I generally recommend browning the meat as it makes for a better broth! This is totally optional and won’t make a big difference. Vegetables: Add some vegetables and some broth. Cook: Turn it on, and let it cook away until everything is melt in your mouth tender. 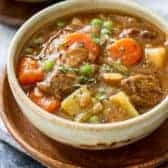 What Cut of Beef is Best for Soup? 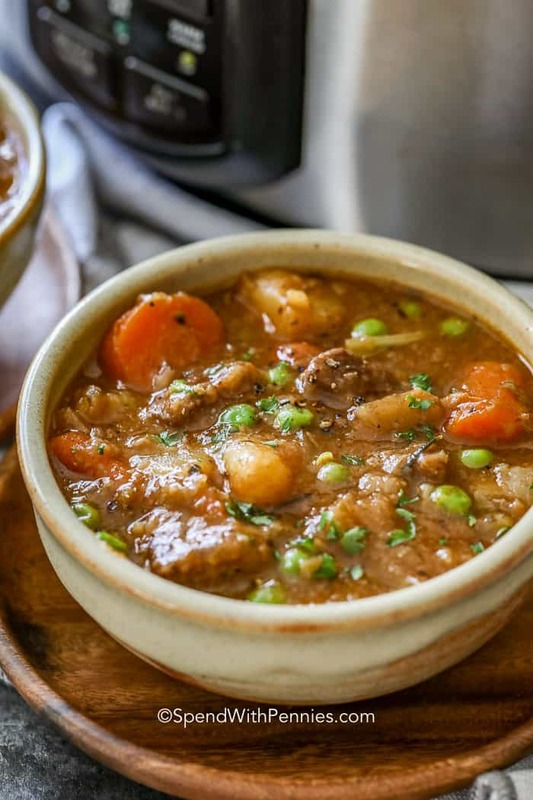 Because the meat is slow cooked in broth, it doesn’t need to be an expensive cut of beef to be tender in this crockpot vegetable beef soup. I like to check my grocery store flyers to see what is on sale. If there is a particular roast that is on for a great price, I’ll buy one and cube it up to make this soup. If you’re not a sale shopper, chuck roast is a great option and will make for some incredibly tender beef. 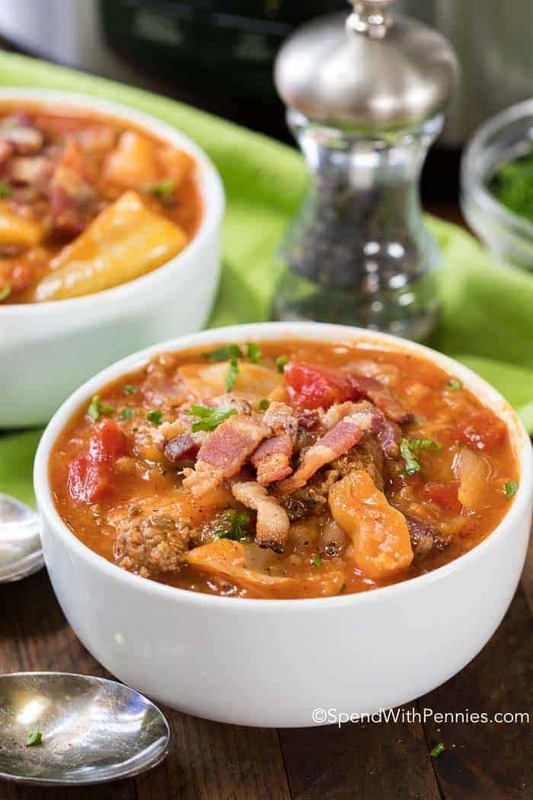 If you’ve got ground beef instead, you will want to check out my Easy Hamburger Soup for an inexpensive, hearty meal. 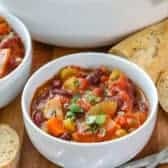 15 Bean Slow Cooker Chili – always a home run! Slow Cooker Chicken Enchilada Soup – reader favorite! Crockpot Chicken Noodle Soup – comforting & delicious! Easy Crock Pot Ham and Potato Soup – one of my favorite recipes! 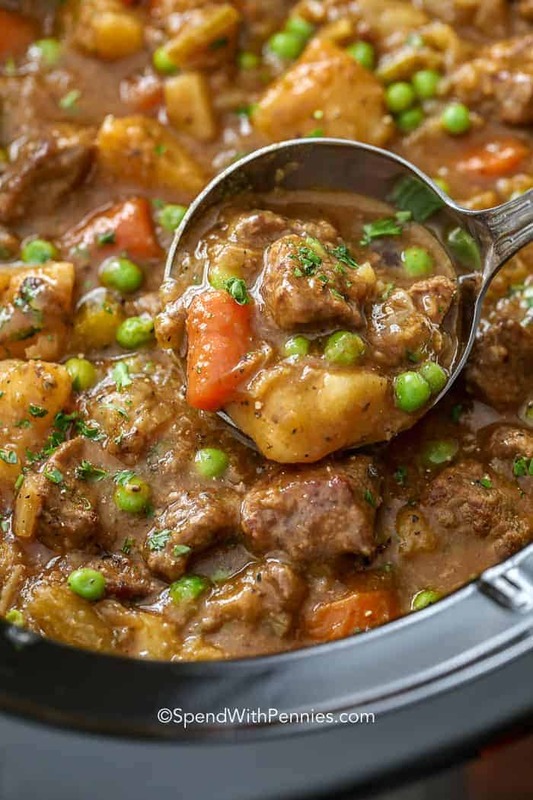 Can I Make This Vegetable Beef Soup Ahead? 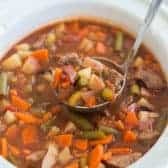 Soup is great for making ahead, and this easy vegetable beef soup is one of the best because the flavors just get better as it sits. This is a great option for meal prepping on the weekend when you have more spare time, and then simply reheating throughout the week. Because it has no pasta or rice, it can be kept in the refrigerator for up to 4 or 5 days. In a large frying pan over high heat, fry beef in oil just until browned on all sides. 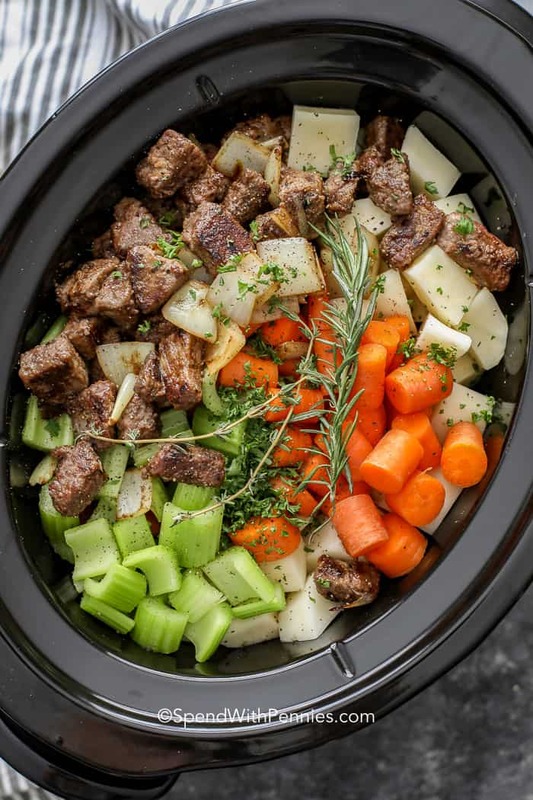 Add beef to a 6 quart slow cooker. Add potatoes, carrots, celery, onion, tomatoes, beans, broth, tomato sauce, tomato paste, salt, garlic, parsley, paprika and pepper to slow cooker and stir to combine. Cover and cook on low for 8-9 hours, until beef and vegetables are tender. White chicken chili is one of our go-to easy weeknight dinner ideas. Chicken, poblano peppers, mild green chilis, corn, and white kidney beans are slow simmered in a savory chicken base. Stir in some sour cream and top it with tortilla chips and cilantro for the perfect white chili recipe! 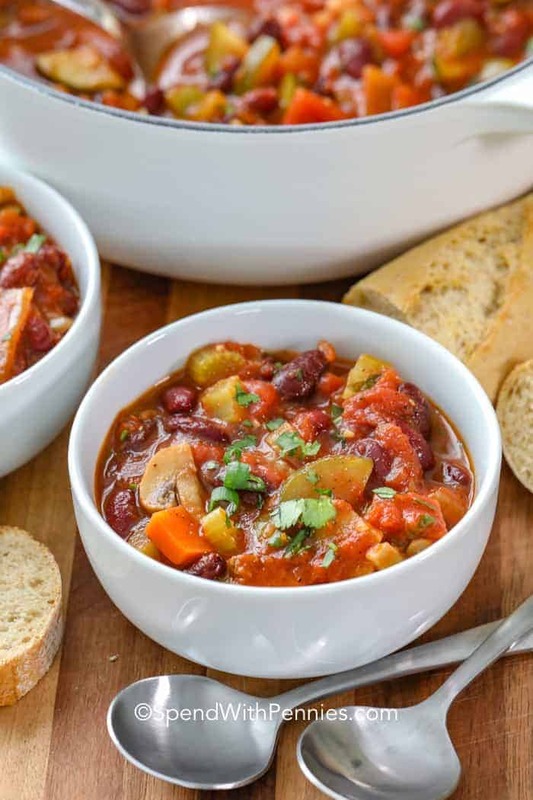 Hearty chili recipes are all the craze at our house and even better when they’re as healthy as this skinny chili recipe. From a classic chili recipe to a simple slow cooker chili, we love making this deliciously hearty comfort food. This creamy white chicken chili recipe is a simple dinner that is ready in just 40 minutes, making it a fairly quick and simple dinner recipe that is both healthy and delicious. If you’re wanting to turn this into a slow cooker white chicken chili, it adapts super easily. Cook the onions and peppers as directed, add the chicken and cook a few minutes longer. 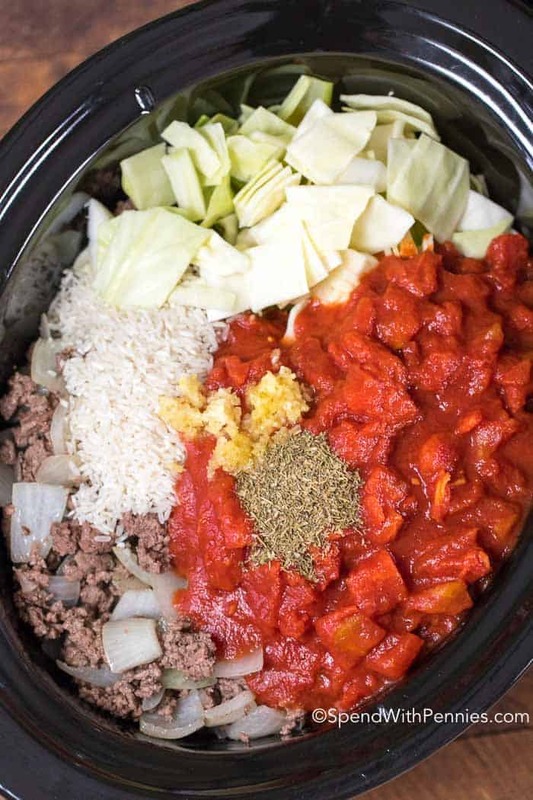 Add the mixture along with remaining ingredients to the slow cooker (except the sour cream). Cook on high for 4 hours or low for 6-8 hours. Voila! Dinner is ready when you are. 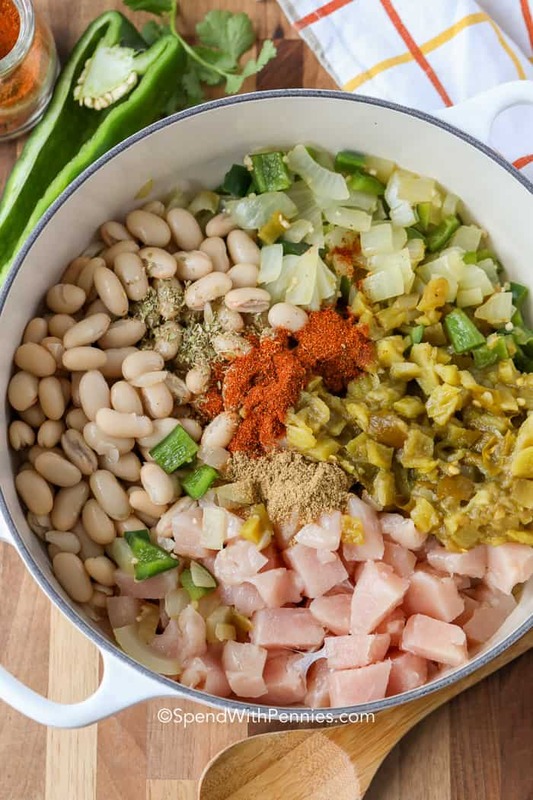 The beans for white chicken chili used in this recipe are white kidney beans (also known as Cannellini beans). 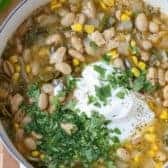 Great Northern beans or or Navy beans are both a bit smaller than the white kidney beans but either can be used in this recipe as well. Dice the chicken into 1/2″ cubes. Soften the onions and peppers over medium heat for about 5 minutes in a dutch oven. Add all other ingredients except the sour cream. Simmer the chili for 25 minutes. Remove from heat and stir in sour cream (it is added after cooking to prevent curdling). Serve with your favorite toppings. To Make White Chicken Chili thicker simmer uncovered a bit longer. Adding a few crushed tortilla chips will also thicken the white chili (it will change the flavor slightly but still delicious). The Best Chili Recipe – Truly the best ever! 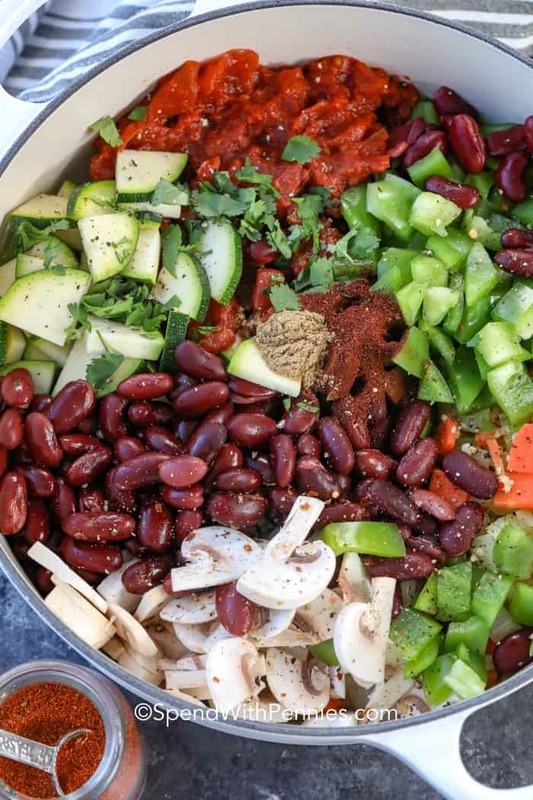 15 Bean Slow Cooker Chili – full of beans! 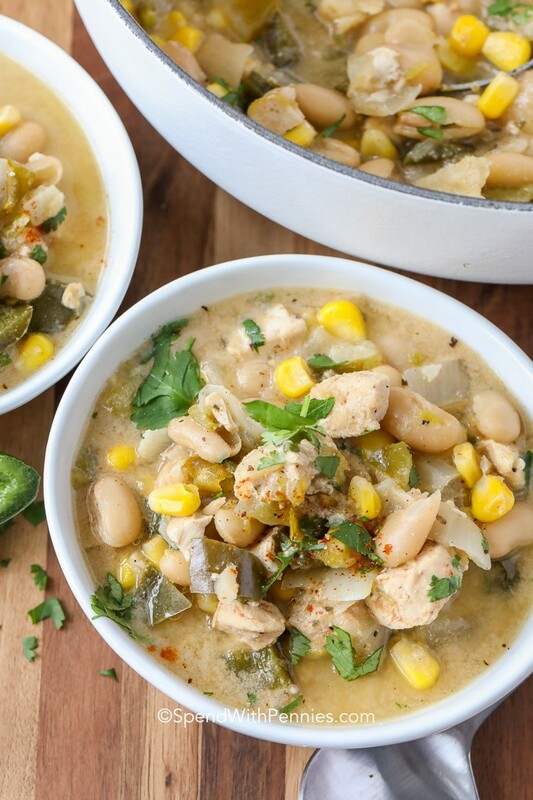 Whatever your taste, this creamy white chicken chili is the winner winner chicken chili dinner! 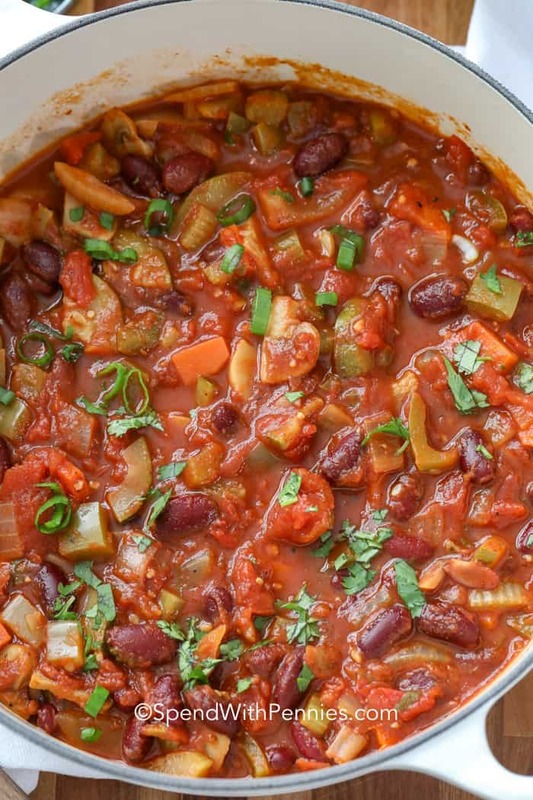 Refrigerate this chili recipe for up to 3-4 days. To store it longer, place leftover chicken chili in freezer bags or a sealed container and freeze up to 3 months. 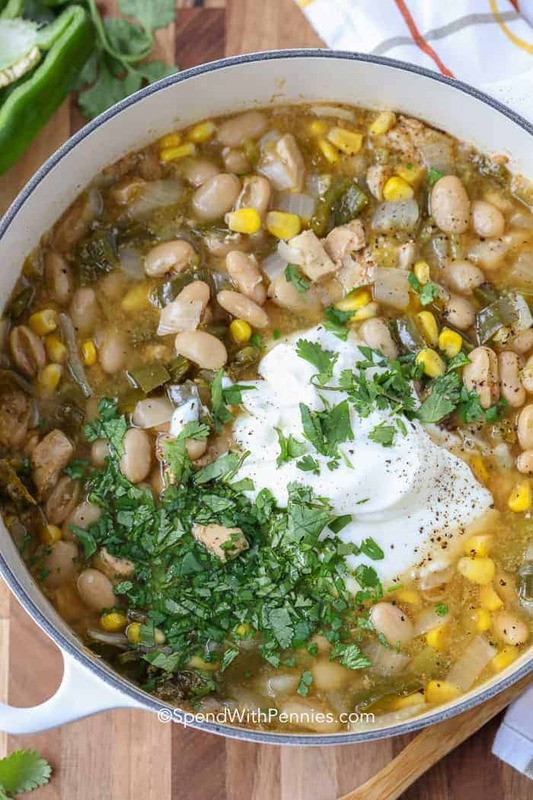 This white chicken chili recipe is one of our go-to Mexican inspired dinners. Chicken, poblano peppers, green chilis, corn, and kidney beans are slow simmered in a savory chicken base. Add olive oil to a dutch oven. Soften onion and peppers over medium heat until translucent (do not brown). Add remaining ingredients except sour cream. Cover and simmer 25 minutes. Remove from heat and stir in sour cream and cilantro. Serve with your favorite toppings. Notes: Green bell peppers can be substituted for poblanos. If you’d prefer a thicker white chicken chili, remove lid after 15 minutes and simmer uncovered.